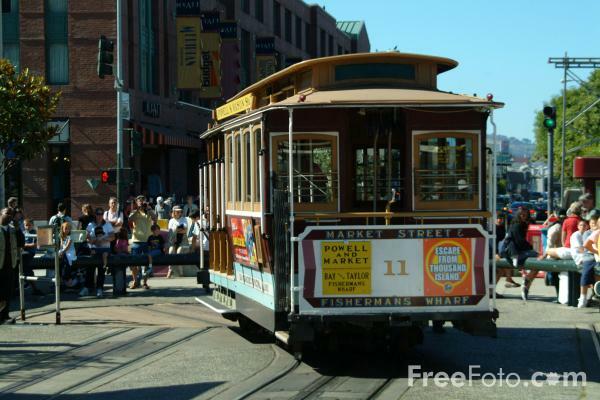 Photographs of The San Francisco Cable Cars, San Francisco, California. the San Francisco cable cars are the only moving National Historic Landmark, and 9.7 million people take a nine mile per hour ride on them each year. The three current operating lines are Powell-Mason, Powell-Hyde and California lines. The first two start at a turntable at Market & Powell street and the last one starts at Market & Drumm Street. The Powell-Mason line runs over Nob Hill, Russian Hill and ends at Aquatic Park. The Powell-Hyde line runs over Nob Hill to Fisherman's Wharf. The California Street line runs from the Financial district over Chinatown, Nob Hill to the Van Ness Avenue. There are currently 40 cars in service: 28 single-enders serve the Powell Street routes and 12 double-enders serve the California Street route. VIEW: More images from the category San Francisco Cable Cars, San Francisco, California or around the same time .